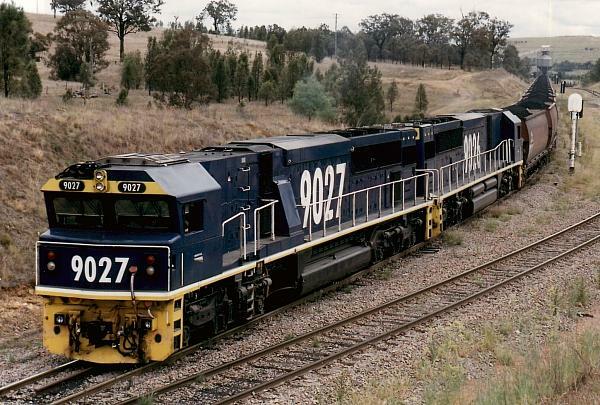 The 90 class was built by Electro-Motive Division in London, Ontario, Canada and also by Clyde Engineering at Braemar, NSW. The first unit was in service in 1994. There are 35 units in the class, numbered 9001-9035. They have a V16 turbo-charged 2 stroke EMD 16-710G3A engine. They weigh 165 tonnes and have 3800 HP available for traction. 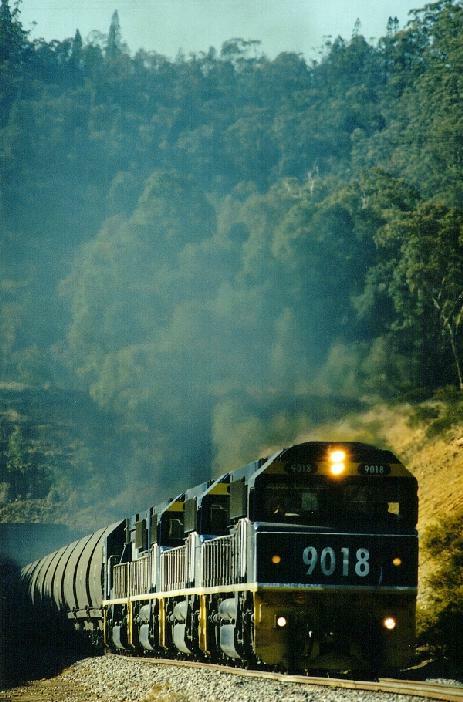 9029 & 9004 climb the grade from Singleton into Camberwell Junction, passing an ARHS ACT division railcar tour. June 8th, 1997. 9018, 9028, 9016 & 9008 lead Freight Rail's longest ever Coal Train. It consisted of 4 90 class locomotives, 105 NHRH coal hoppers, and the Brake Test Car NDMF18E. 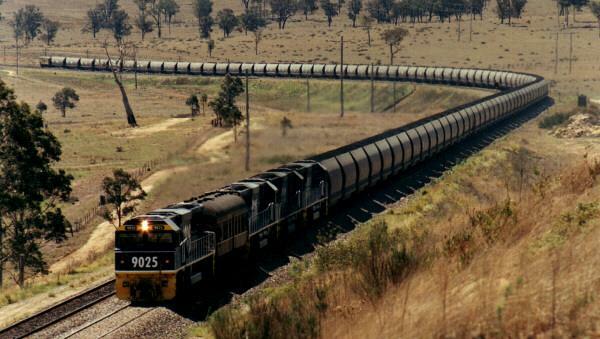 The total length of the train was around 1800 Metres, and the total tonnage was around 13300 tonnes. This view is from the Brake Test Car at the Rear of the train looking forward. The locomotives can just be seen. This is one of only 4 locations on the whole trip where the front of the train could be seen. 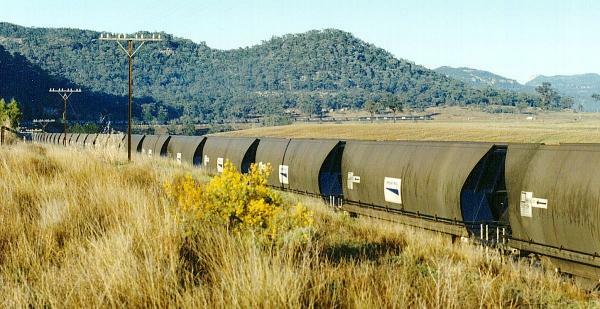 The train is at Bylong on September 5th, 1995. 9018, 9028, 9016 & 9008 lead Freight Rail's longest ever Coal Train. It consisted of 4 90 class locomotives, 105 NHRH coal hoppers, and the Brake Test Car NDMF18E. 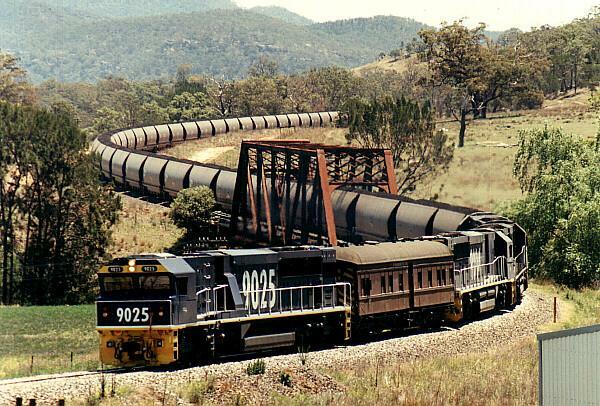 The total length of the train was around 1800 Metres, and the total tonnage was around 13300 tonnes. This view is of the train emerging from Coxs Gap Tunnel on September 4th, 1995. 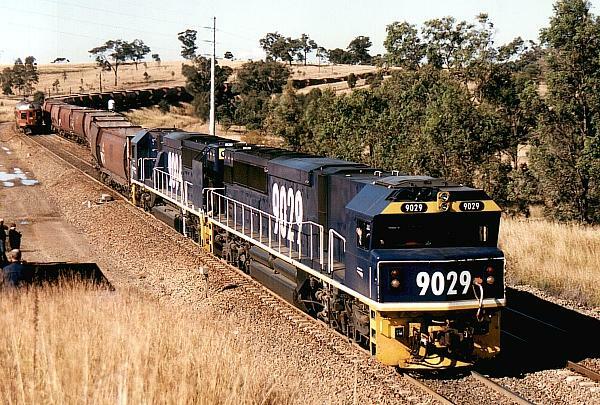 9018, 9028, 9016 & 9008 lead Freight Rail's longest ever Coal Train. It consisted of 4 90 class locomotives, 105 NHRH coal hoppers, and the Brake Test Car NDMF18E. The total length of the train was around 1800 Metres, and the total tonnage was around 13300 tonnes. 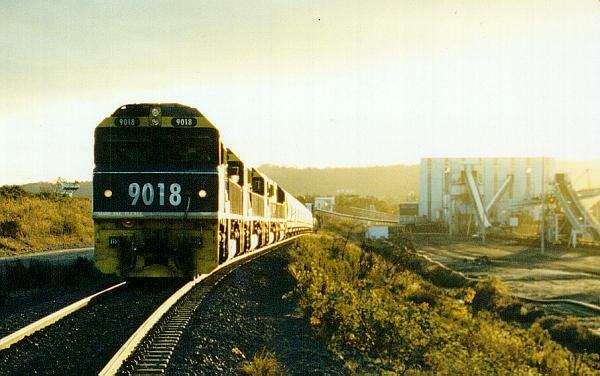 This view is about 14 wagons from the rear of the train looking towards the locomotives at Kerrabee crossing loop on September 4th, 1995. 9018, 9028, 9016 & 9008 lead Freight Rail's longest ever Coal Train. It consisted of 4 90 class locomotives, 105 NHRH coal hoppers, and the Brake Test Car NDMF18E. The total length of the train was around 1800 Metres, and the total tonnage was around 13300 tonnes. It is seen here at the loader at Ulan. The front of the train is facing the opposite direction to the rear! September 5th, 1995. 9018, 9028, 9016 & 9008 lead Freight Rail's longest ever Coal Train. It consisted of 4 90 class locomotives, 105 NHRH coal hoppers, and the Brake Test Car NDMF18E. The total length of the train was around 1800 Metres, and the total tonnage was around 13300 tonnes. This view is prior to departure from Ulan under heavy skies on September 5th, 1995. 9018, 9028, 9016 & 9008 lead Freight Rail's longest ever Coal Train. It consisted of 4 90 class locomotives, 105 NHRH coal hoppers, and the Brake Test Car NDMF18E. The total length of the train was around 1800 Metres, and the total tonnage was around 13300 tonnes. This view is prior to departure from Ulan on September 5th, 1995. 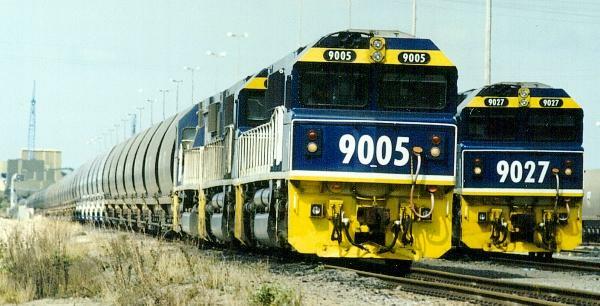 9005 and 9027 stand at the starting signals at Kooragang Island on Fathers Day, 1995. 9005 is leading an 84 wagon Coal train.